Jihad Watch : The Qur’an famously says that “there is no compulsion in religion,” (2:256), but what constitutes “compulsion” is in the eye of the beholder. The institutionalized subjugation of the dhimma, with its regular humiliation and harassment, from which one can be freed for the simple price of converting to Islam, is not considered compulsion. Remember Steve Centanni and Olaf Wiig, the journalists who were kidnapped and forced to convert to Islam — even though their conversions were obviously coerced, their captors made them say that they were converting freely, and the captors probably believed that themselves. After all, the journos could have chosen to be killed instead. “Sikh community in Hangu ‘being forced to convert,'” by Umer Farooq, Express Tribune, December 16, 2017 (thanks to The Religion of Peace): PESHAWAR: The Sikh community raised on Friday serious concerns after ‘being forced to convert to Islam’ by a government official in Hangu district of Khyber-Pakhtunkhwa (K-P). 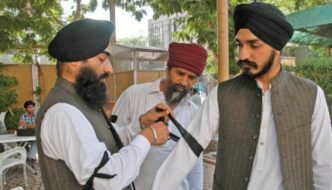 Lodging a complaint with Deputy Commissioner Hangu Shahid Mehmood, the community members claimed Assistant Commissioner Tehsil Tall Yaqoob Khan was allegedly forcing Sikhs to convert to Islam. District Nazim Hangu for minority Farid Chand Singh, who filed the complaint, said the community members have been living in the area since 1901 and were never offended by anyone, specifically for religious believes rather lived all their lives peacefully with Muslims. Singh stated that despite having been a hotbed for sectarian conflicts, residents of Hangu district never harmed them, were never approached by someone to convert to Islam, adding they have friendly relations with Muslims who have always stood up for the community when in need. “Had it been from someone ordinary, it would have never been felt so offending but when you hear such things from a government official, it becomes something really serious,” Singh told The Express Tribune. “We the residents of Doaba area are being tortured religiously,” read the complaint.